This topic describes how to update a removable or in-chassis device's firmware using the Windows Update (WU) service. For information about updating system firmware, see Windows UEFI firmware update platform. To do this, you'll provide an update mechanism, implemented as a device driver, that includes the firmware payload. If your device uses a vendor-supplied driver, you have the option of adding the firmware update logic and payload to your existing function driver, or providing a separate firmware update driver package. If your device uses a Microsoft-supplied driver, you must provide a separate firmware update driver package. In both cases, the firmware update driver package must be universal. For more info about universal drivers, see Getting Started with Universal Windows drivers. The driver binary can use KMDF, UMDF 2 or the Windows Driver Model. Because WU cannot execute software, the firmware update driver must hand the firmware to Plug and Play (PnP) for installation. Identify the device to which it is attached. Determine whether the driver has a firmware version that is more recent than the version on the device. If a firmware update is necessary, set an event timer to schedule the update. Otherwise, do nothing until the driver is started again. If an update is queued, wait for a set of conditions to be met. When conditions are met, perform the firmware update on the device. Submit your firmware update package as a separate driver submission. In this case, the function and firmware device nodes must have different hardware IDs in order to be targeted independently. There are a couple ways to create a second device node. Certain device types have the ability to expose a second device node on one physical device, such as USB. 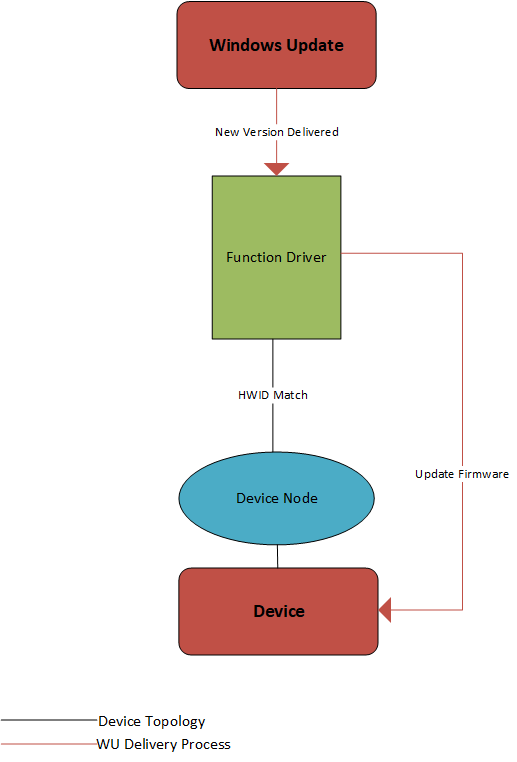 You can use this functionality to create a device node targetable by WU, and install a firmware update driver on it. Many device types, however, do not allow a single physical device to enumerate more than one device node. For future firmware updates, update the INF and binary file containing the firmware payload. 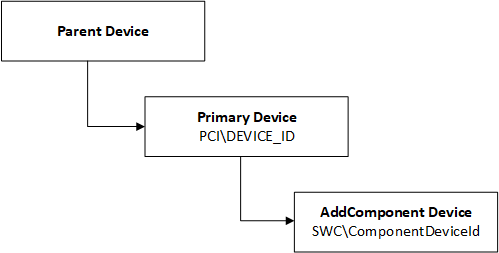 To update firmware for devices that use a Microsoft-supplied driver, you need to create a second device node, as shown above. PnP resolves this location when it installs the device. The driver can then open this registry key to determine the location of the payload. To locate another device node, the firmware driver should walk the device tree relative to itself, not by enumerating all device nodes for a match. A user may have plugged in multiple instances of the device, and the firmware driver should only update the device with which it is associated. Typically, the device node to be located is the parent or sibling of the device node on which the firmware driver is installed. 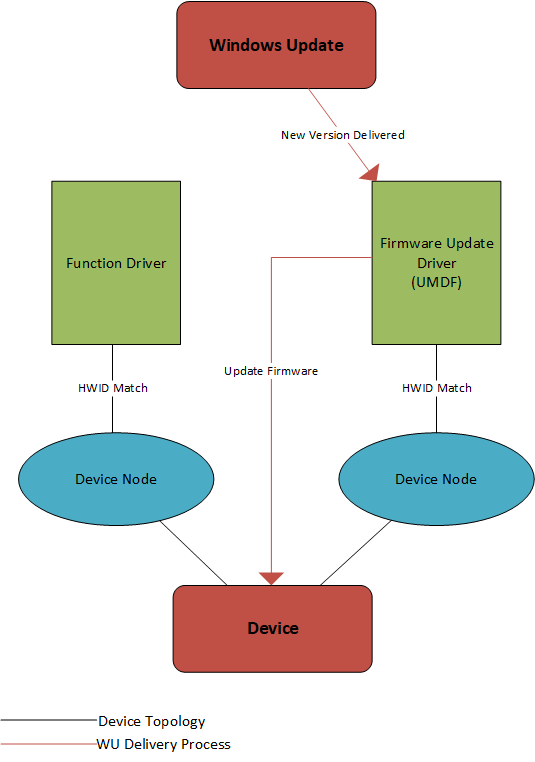 For example, in the diagram above with two device nodes, the firmware update driver can look for a sibling device to find the function driver. In the diagram immediately above, the firmware driver can look for the parent device to find the primary device with which it needs to communicate. The driver should be robust to multiple instances of the device being on the system, possibly with multiple different firmware versions. For example, there may be one instance of the device that has been connected and updated several times; a brand new device may then be plugged in which is several firmware versions old. This means that state (such as current version) must be stored against the device, and not in a global location. If there is an existing method to update the firmware (EXE or co-installer, for example), you can largely reuse the update code within a UMDF driver.